Picross 3D is a 2009/10 DS game that took 2D picross puzzles into three dimensions. The player chips away the unneeded cubes to leave behind a blocky shape. This papercraft is of one of the puzzles - a dog which is featured on the cover art and title screen of the game. It's a simple papercraft with very few parts, but can be slightly fiddly due to the number of awkward angles in the model. Check out the video guide below for help and remember you will need to score every fold. If you print the lineless version, take extra care with this! You may have to take a few measurements to ensure your folds are in the right place. Valoo is a character from the Legend of Zelda: The Wind Waker. He lives atop Dragon Roost Island and protects the Rito tribe that also resides there. When a Rito comes of age, they travel to the top of Dragon Roost to receive a scale from Valoo that enables them to grow their wings. When Link first travels to the island a monster is torturing Valoo, preventing young Rito from getting their wings. Link must defeat the monster using Valoo’s tail in the very first boss battle of the game. The papercraft stands at about 12cm tall, depending on how high up you position the head. It wasn’t created in Pepakura, so unfortunately there is no .pdo to help with construction, but for help there are full diagram instructions with the recommended build order, and check out the finished build picture for the positioning of parts. Murfy/Murphy is Rayman's flying green guide. He first appeared in Rayman 2, and gives tips and hints to the player. Tips: Build the head, body and feet, closing with the pieces without flaps. 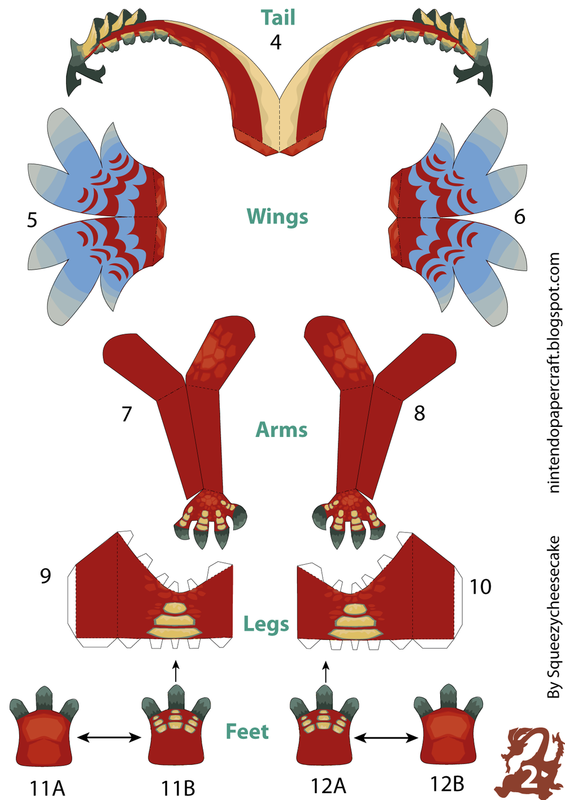 Stick the wings and arms back to back and glue them to the body, then add the feet and the head. The Teensies are a magical race appearing in the Rayman series. This papercraft is of four particular Teensies, the Grand Minimus, who are the kings of the Teensies. Originally only one of them was king, but they have all forgotten which one. Pigs played a similar role to cuccos in the Legend of Zelda: The Wind Waker. They will run away when chased, but are easy to catch if you sneak up behind them. When fed bait, they will dig in the ground and might uncover something interesting. Tips: Follow the build order on the templates. the lettered parts are legs and ears, and there are corresponding letters next to the holes they should fit into. Based on the sprites from The Legend of Zelda, the compass is an item that is found in each of the various dungeons in the game. Once you find it, it will point out treasure chests and the location of the boss on the map. Tips: Follow the number order and take take when sealing the base with the last piece. Don't forget you need to score every fold, so use the lined version as a reference if you want to work with the lineless version. Here's a nice, simple papercraft which you should be able to build in about half an hour! One of the people created by Polokus, Globox is Rayman's chubby, loveable friend and sidekick. Tips: Super easy, build down the page following the numbers for the 7 3D parts, then glue on the 5 2D parts in appropriate places. You can stick the feet to the bottom like he's standing up, or like in the picture, so it looks like he's sitting down. A really simple, easy to build papercraft. It is Dragonite, imagined as if its body was just a sphere. This is a similar concept to 'Cubee-Craft', a popular way of turning characters into very simple templates using a cube as a base. Dragonite is a Dragon/Flying Type Generation 1 Pokémon. A really simple, easy to build papercraft. It is Pikachu, imagined as if his body was just a sphere. This is a similar concept to 'Cubee-Craft', a popular way of turning characters into very simple templates using a cube as a base. Pikachu is an Electric type from the first generation of Pokémon. Crabs feature in the Zelda game The Legend of Zelda: the Wind Waker. These crabs can be found on Outset island as well as a few other beaches across the game. They cannot hurt Link, and will bury themselves in the sand if he approaches. 6 Papercrafts in one! This papercraft is of the fruits which feature in Super Mario Sunshine. They have a big role in the game from changing Yoshi's colour to being the focus of the boss battle against King Boo in Hotel Delfino. Build a coconut, durian, papaya, pineapple, red pepper and a bunch of bananas. If you want, you could always ignore the fact the models are from a Mario game, and build yourself a nice fruit bowl. Variable! Height around 15 cm. All 6 crafts total 21 pages. Here's a nice easy papercraft you can build very quickly. This epic scene happens at the end of The Legend of Zelda: A Link to the Past. After Link defeats Ganon, the Triforce appears before him and peace is restored to Hyrule. There are four included figures, so you can have 2 versions of Link, Zelda, or even Ganon standing before the triforce. You can build in any order, just be careful with the stairs which can be quite fiddly. This craft is of their appearance in Super Mario 64. The template is relatively easy, although a little small, so can be fiddly. Build everything else before attaching the pink mouthpiece.